The Pink Ranch: A grand tour. 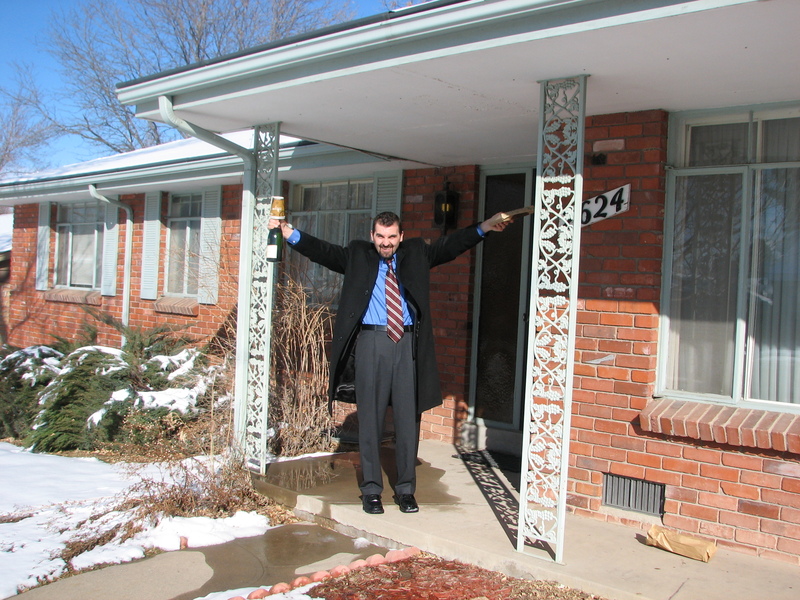 Here is our fair house, a modest 1963 Ranch in Denver. We closed on Valentine’s Day in 2007. 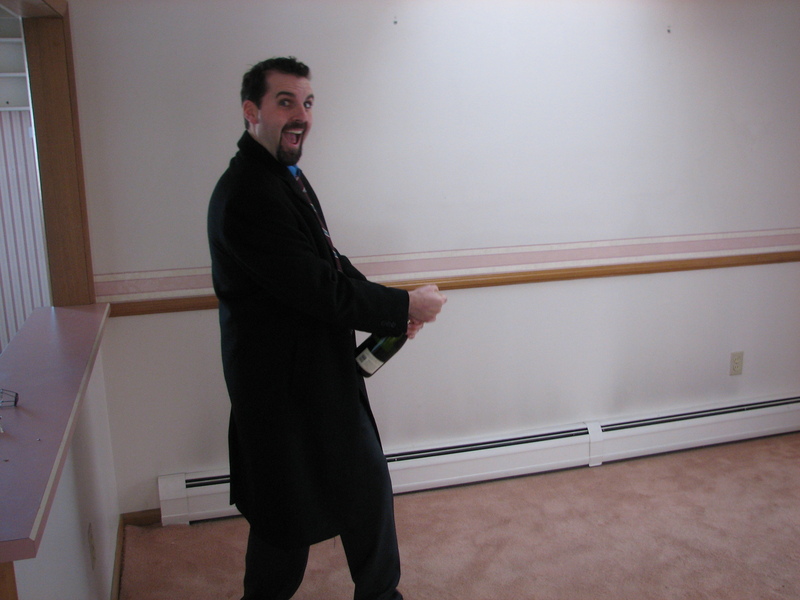 The Hus was horribly sick with the flu and we couldn’t even enjoy our bottle of champagne. Nor could we enjoy the insane two months of preliminary renovations waiting for us, which has to be finished before we could move in. The flu of course passed on to me. Ever ripped up tack strip with a fever? It’s super fun! Yes, the outside is a lovely mint green to compliment all the pink inside. This is the front room, the living room which faces the street. The dining room, which attaches to the kitches via a pony wall just behind The Hus. 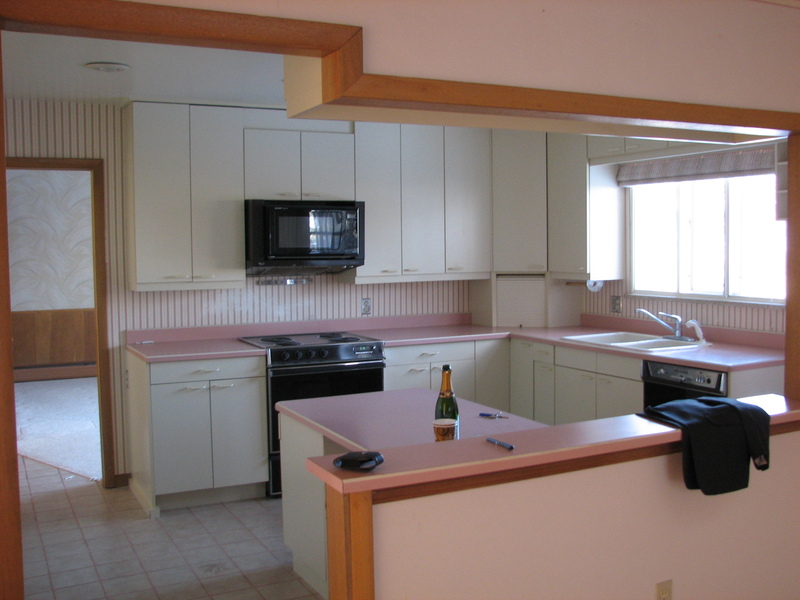 The pink kitchen with bisque appliances and bisque laminate cabinets. A great size and layout though! Another view of the kitchen looking back into the dining room. 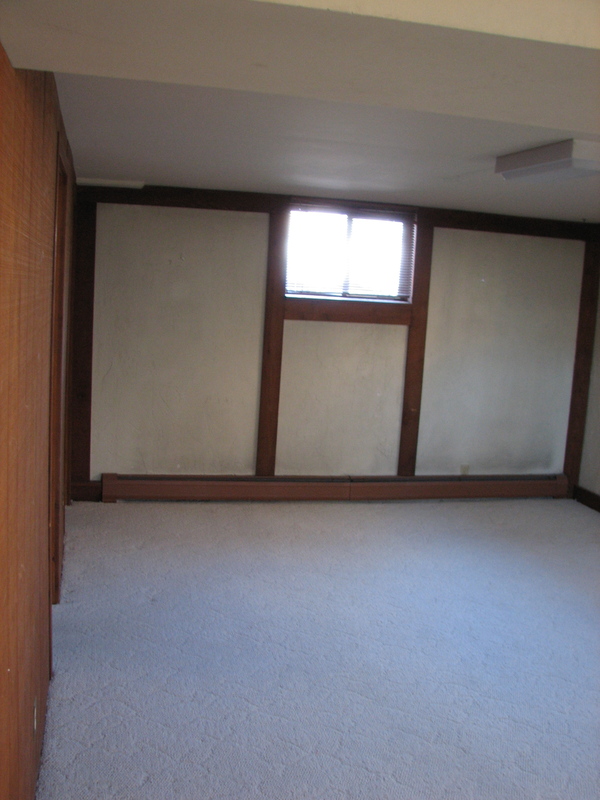 This is a bedroom which will eventually serve as an office. 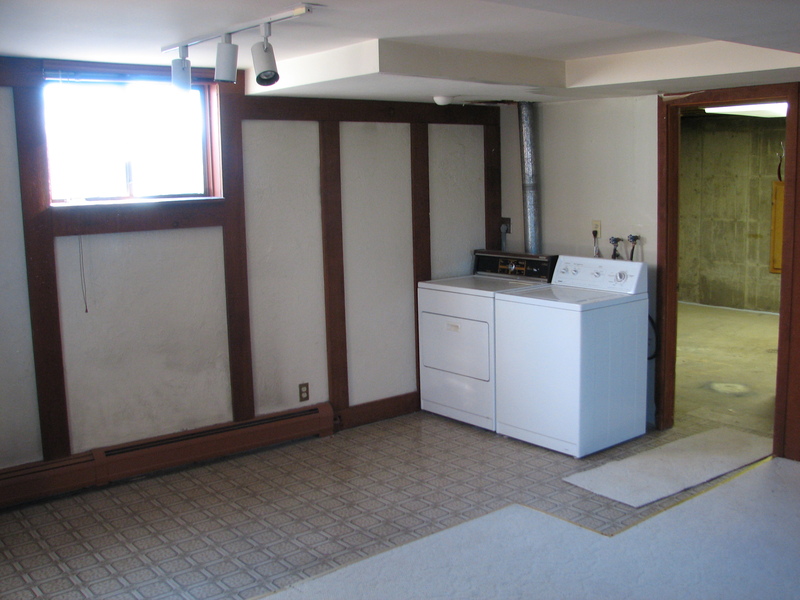 There are three bedrooms upstairs and 1 bed and bath in the "finished" (use that term loosely) basement. The second bedroom. Why no pink? We'll never know. 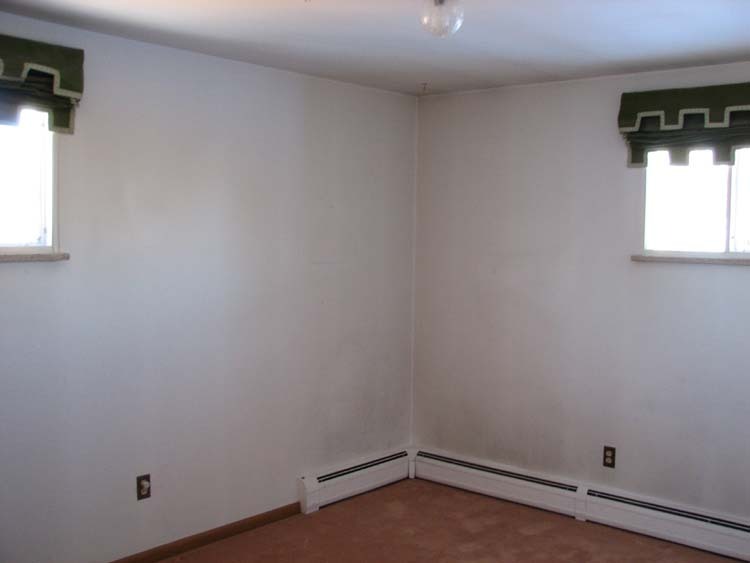 It's so great how clean the walls are, though. Har. Har. Nothing a whole lotta paint can't fix. 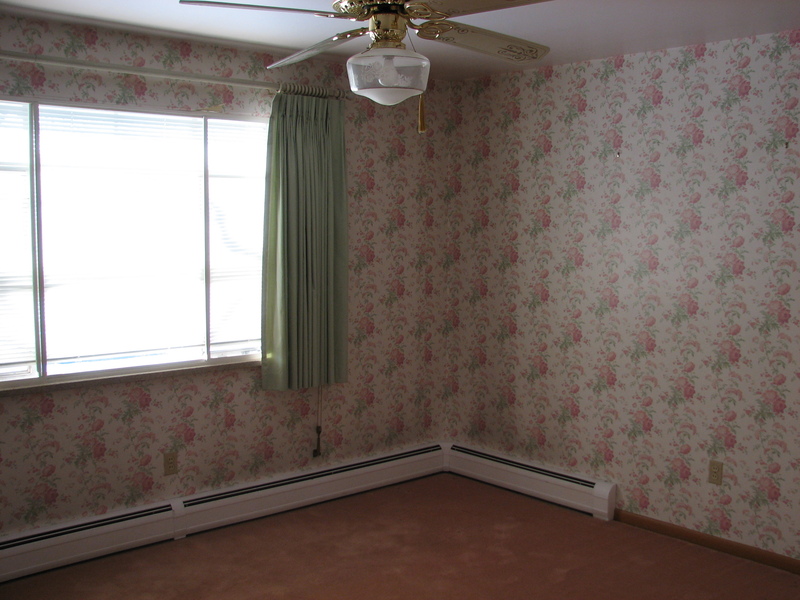 Ah, the master bedroom in all it's pink, mint green and brass fixture glory. 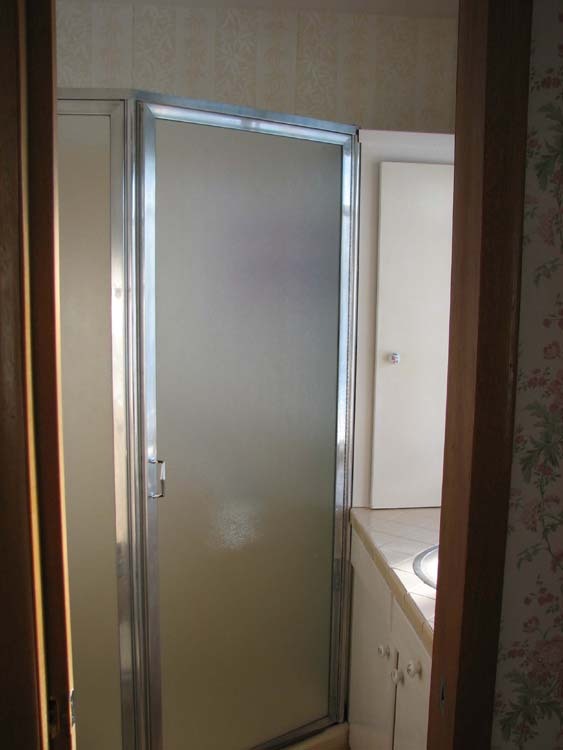 You're looking at a pocket door into the world's tiniest master bathroom. See? So small and awful and clearly designed by insane people. We can't even shimmy in to fully photograph it. 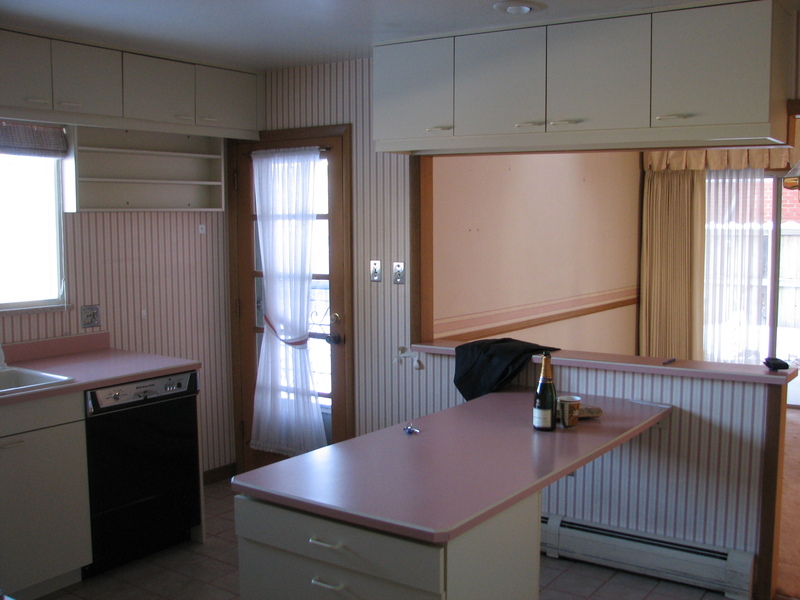 This is the pink bathroom, and the main/guest bathroom for the whole house. Yep. That's a pink bathtub you're looking at. 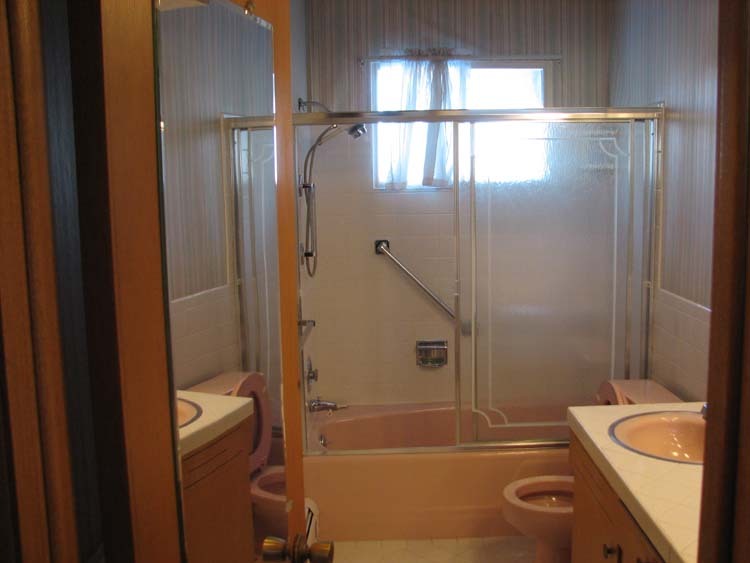 And two pink sinks, a pink toilet (with padded pink seat cover!) and a mirror on the OUTSIDE of the door, so when you're walking down the hallway you can check yourself out. 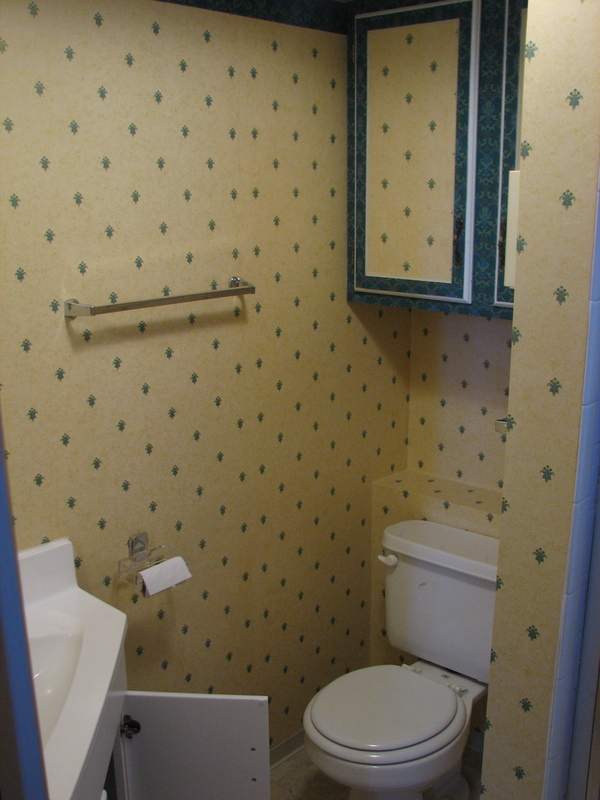 Now on to what I think was my favorite little nugget of decorating in this house: the downstairs bathroom. 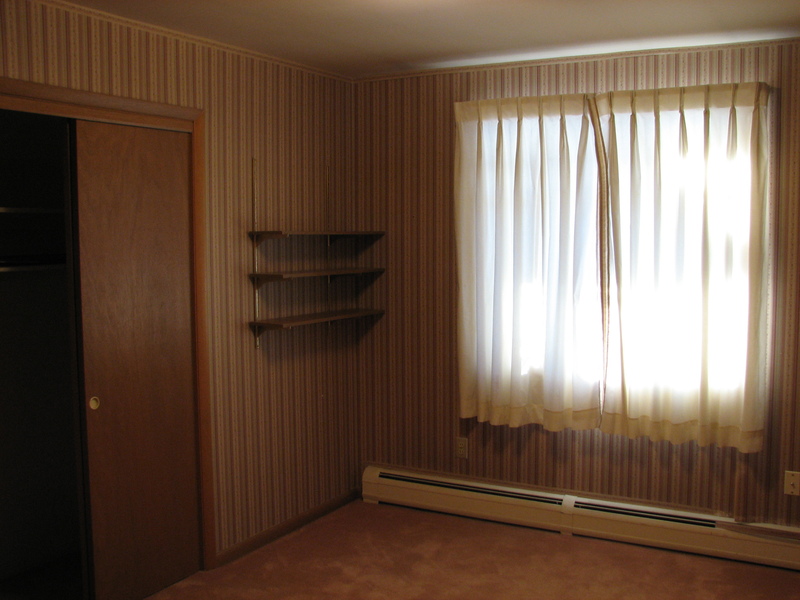 In a total departure from pink the previous owners decided to embrace the seizure-inducing color combo of yellow and blue! 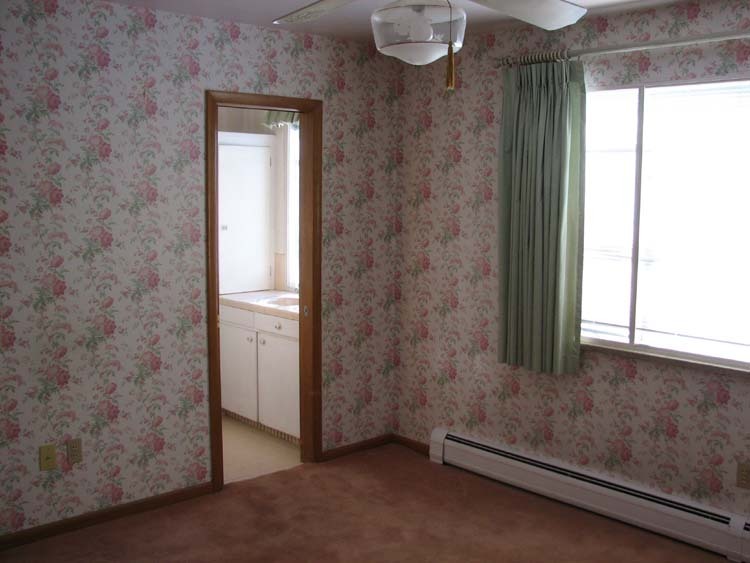 They loved it so much they wallpapered the ENTIRE bathroom in it. What do I mean by entire? I mean EHN-TY-ER. Like the cabinets, and of course, why not keep going across the back of the bathroom door? 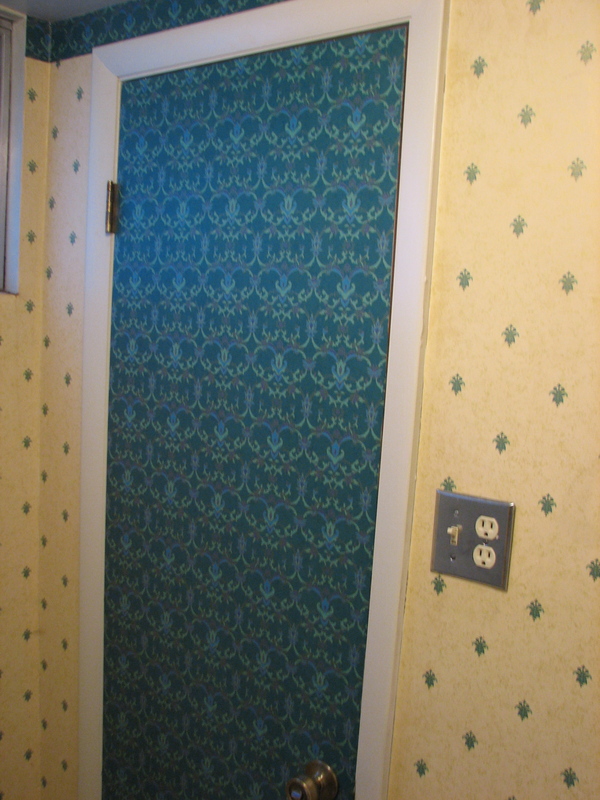 Note masterful wallpapering skills which continue the pattern without regard to cabinet doors. Oooh! A contrasting pattern! Perfect for a DOOR! 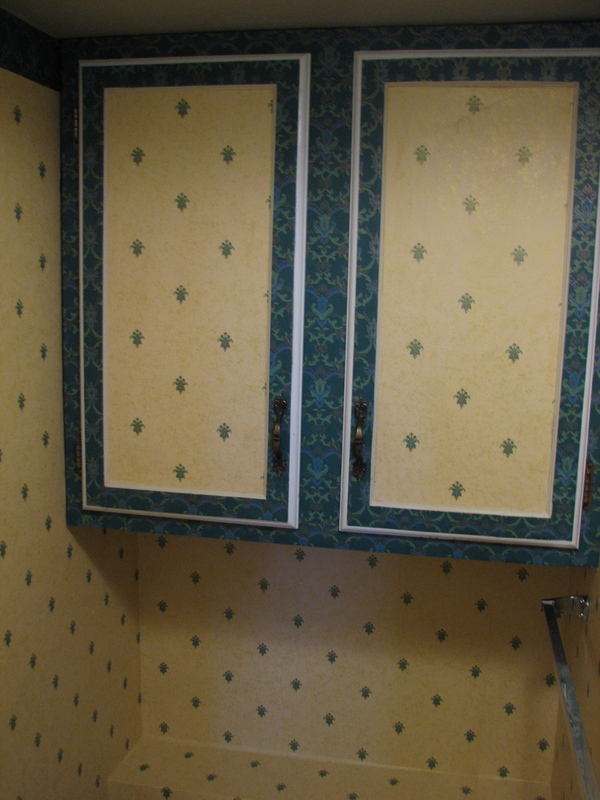 Just one more look at them wallpapered cabinets. The basement. 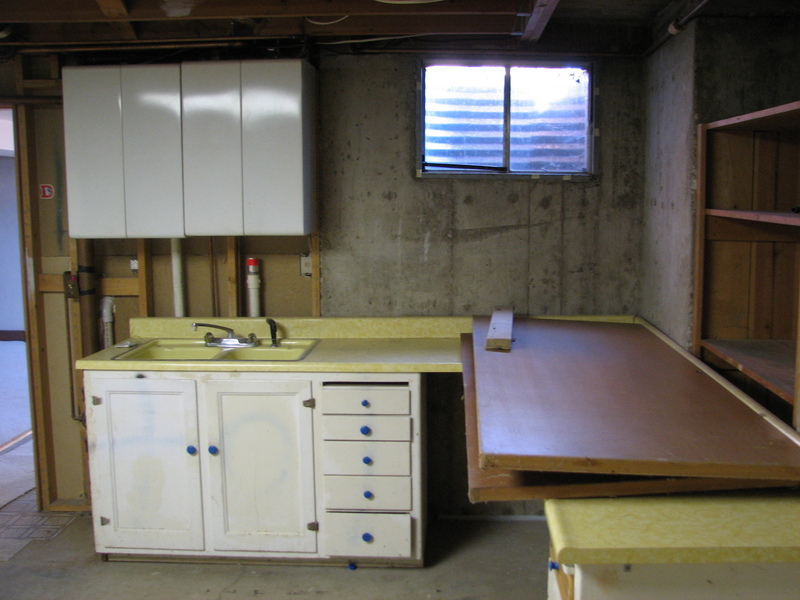 1/4 of the space is randomly tiled and the washer/dryer were placed on the outside of the utility room. Really cheap wood slabs were loosely nailed to the walls as a...border? And the walls were so dirty. So very, very dirty. 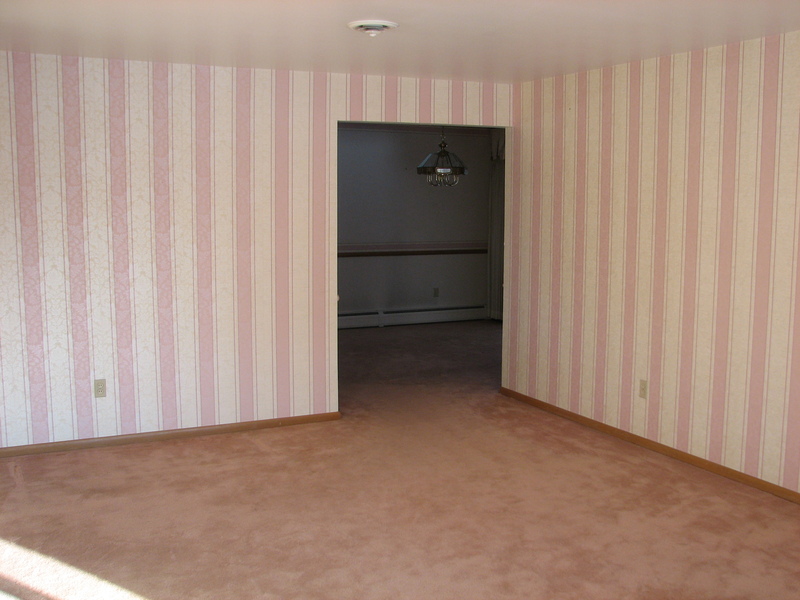 On a positive note, this space does lead to a massive crawl space. So there’s the nuts and bolts of the good bones of the house. 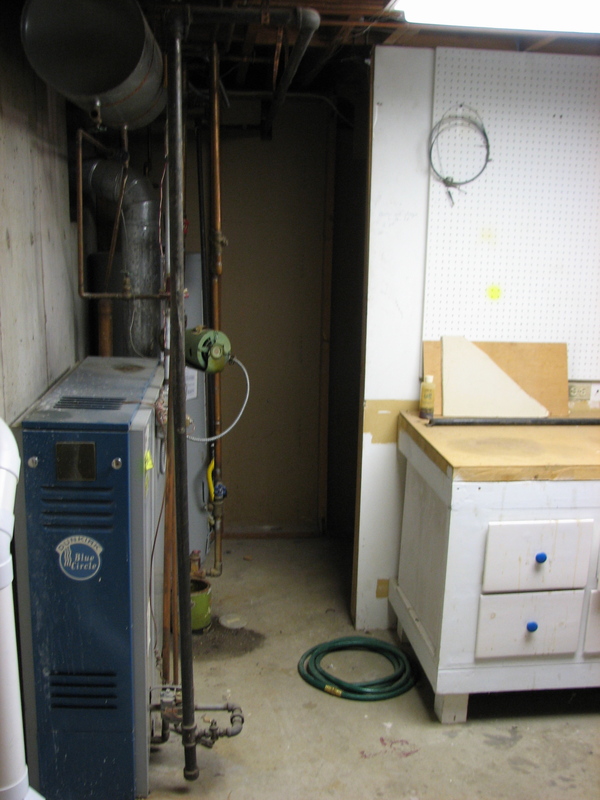 This was four years ago and we’re still working on the space, de-pinking it room and bringing out her hidden beauty. Over the last four years The Pink Ranch has very much become our home, and even with all her bizarre quirks and unanswered questions we love this place very much. At first it was just me and The Hus, and now the home is filled with two gorgeous dogs and a beautiful baby girl. We are blessed. And, we are tired.